Beasts born in Atheria, like Humans born there, gain a Birthright – abilities derived from the magic of the domain in which they’re born. Thus, here are another couple of inhabitants of Dernmarik – the realm of dimensional magic. Pigs are adaptable sociable omnivores, scavengers, and predators, capable of surviving in a wide variety of environments. They’re quite intelligent, and normally weigh about as much as a human does (and are just as prone to extremes of size). 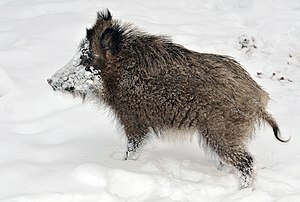 While pigs are widely domesticated, the domestic pig is a mere subspecies of the wild boar – and will quickly interbreed and revert to type if given the opportunity. In either case, they’re quite dangerous (especially in injured or threatened) – even without a magical Atherian Birthright. There are some realms of Atheria where attempting to keep pigs is, at best… ill-advised. Dernmarkian Reaching Razorback (Wild Boar, 18 CP). Reaching Razorbacks are one of the subtypes that no one sane attempts to keep; while they aren’t inherently hostile, they can kill a human (or especially a tasty-looking child) very casually – employing the same dimensional manipulations that they use to pull fruit out of trees and defend themselves from predators. As a side-effect, they can somewhat manipulate their other dimensional relationships – granting them the ability to modify their size, a trick that they use to fit through small places or to increase their ability in battle. Reaching Razorbacks tend to escape confinement with ease – enlarging themselves to dig holes and push down fences and gates, shrinking to fit through small holes, and easily reaching fastenings that would be out of reach of any normal animal. Worse, they can attack at range, and several times before they’re reached if they don’t like whatever’s approaching – and will do so as a group. They’re best dealt with using ranged weapons or magic, although they’re tough enough to make even that difficult. Innate Enchantment (All effects either Spell Level Zero or Spell Level One, Caster Level One, Unlimited-Use Use-Activated, Personal Only, for a 700 or 1400 GP effective value). Enlarge Self, Reduce Self, Immortal Vigor I (Adds +12 + [2 x Con Mod] hit points), and Resistance (L0, +1 to saving throws) (6 CP). Lunge (+5′ effective reach), Specialized/only with jaws (3 CP). Bonus Uses/+2 Attacks of Opportunity per Round (3 CP). Martial Art/Razorfang Style (Str): Power II (Raises primary attack to 1d12), Toughness 1 (gains DR 1/-), and Reach (for a total reach of 15′) (6 CP). More tricks than you can shake a boulder at. A Dernmarikian Vanishing Hyrax (use the base attributes for a Monkey) is a mildly unusual creature, and is probably an import that established itself since it really doesn’t seem to fit into the local ecology. A climbing vegetarian creature, it might be described as a monkey-like rabbit – but is more closely related to the Elephant than to most other creatures. The Dernmarik variant is a very clever animal – in fact, borderline sapient – and is capable of drawing trivial magical effects from other dimensions to suit itself. While it’s still too small to have a very powerful birthright, it’s clever enough to use what power it can handle quite effectively – and possesses considerably more versatile abilities than most animals. Self-Development: +2 Int (Only +1 in settings that are not using the half-price attributes rule – still enough to make it sapient, 6 CP). Innate Enchantment (all effects Spell Level One, Caster Level One, Unlimited-Use Use-Activated, for an effective value of 2000 GP/Spell Level). Conjurer’s Tricks (Reduced to L1 throughthe Blood of the Dragon by the sacrifice of a point of dexterity, 2000 GP), Mage Armor (which it can share with a friend, 2000 GP), and Create Water (1000 GP), for a total cost of (6 CP). Arm – put a weapon or other item in your hand when you hold out your hand in a particular way; a Vanishing Hyrax is capable of keeping track of three different items and their respective request-gestures. Attack – actually harass an indicated target with small magics. Cleanse – keeping itself, it’s user, and the immediate area neat and clean. Conceal Item – magicly shuttle an indicated item around your body so that it’s never where anyone else is looking at the moment. Fetch – generally within short range, and by magic. She tends to keep the item conveniently levitated if you don’t take it. Heel – a variant in that it will mostly ride on your shoulder and/or hide in a pocket. Hinder – use it’s magic to inflict small penalties on an indicated target. Ignite – heating liquids or setting small fires as indicated. Perform – doing various minor magic tricks. Tend – use it’s powers to try to stabilize someone who’s dying; it will do this for it’s owner without a command. Ward – using it’s tricks to keep itself and it’s companion comfortable, warm in chill conditions, cool in hot ones, keeping off rain, chasing away bugs, and so on. This neatly compensates for the fact that Hyrax have rather poor temperature-regulation systems. 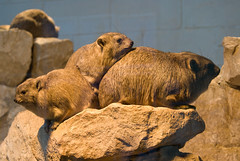 A Vanishing Hyrax can learn quite a few tricks if it wants to; it is, after all, sapient – if pretty dim. In many ways, they act like very small children.